So... this happened one sunny Saturday afternoon, where we joined a couple of avid foodies on a foodtrail using the awesome, cost-saving Entertainer App! If you love dessert wine, you've got to try this. The Gancia Romino Lychee Prosecco (Italy), now going for $42 (takeaway price). The delicate sweetness left me wanting more! Fried Chicken with kimchi yoghurt sauce ($18). A tasty mix which plays with the senses - a sourish sweet aftertaste which goes well with wines. Beef Koftas with chickpea puree, garlic tomatoes and fried onion ($16). Another sourish type dish which they recommend. Most dishes here are created to pair with wines they carry. Praelum - A name associated with erm, yes, wine. That's their signature anyway, when it was opened by wine aficionado Elizabeth Lin in year 2011. Run by a bunch of well trained, professional sommeliers, you bet you can count on them to recommend you wines of your liking. Here, we tried the Reichsgraf Von Kessekstatt "RK" Riesling 2014 (Mosel, Germany) and the Bodegas Lealtanza Crianz 2011 (Rioja, Spain). I personally liked the dry red, it was smooth and tasty. Pork Parcels ($27) - a must-have here, made with portobello, cream cheese, bacon and tomato-basil dressing. Everyone was so in love with this dish, especially with the excellent combination with the flavourful apple chutney on the side. Salmon-En-Croute ($32), while most chose the pork parcel to be their favourite, I'm not sure why this was my favourite. But it is. Salmon loin, dill-tarragon butter, puff pastry, wholegrain mustard. The entire mix was just delicious to me and I really like what they serve up here - you can just taste the passion that goes into making the food right, if not for anything, you know? Tarte Flambee ($20) - Creme fraiche, onions bacon and egg. This brunch-type item is one of those I definitely want to wake up to in the mornings. Nuff' said. MEATLiquor Singapore, a flashy diner bar that serves up good finger food and bar drinks. We tried the fried pickles with blue cheese dip ($9), Sambal fries ($12), Buffalo wings ($15), Dead hippie ($22)! I liked the Sambal Fries and the dead hippie, which boasts juicy mustard-fried beef patty and dead hippie sauce. Don't worry, all food (shown in the photos above) were in tasting portions, so you can be sure that you'll be getting bigger serving sizes when you visit! 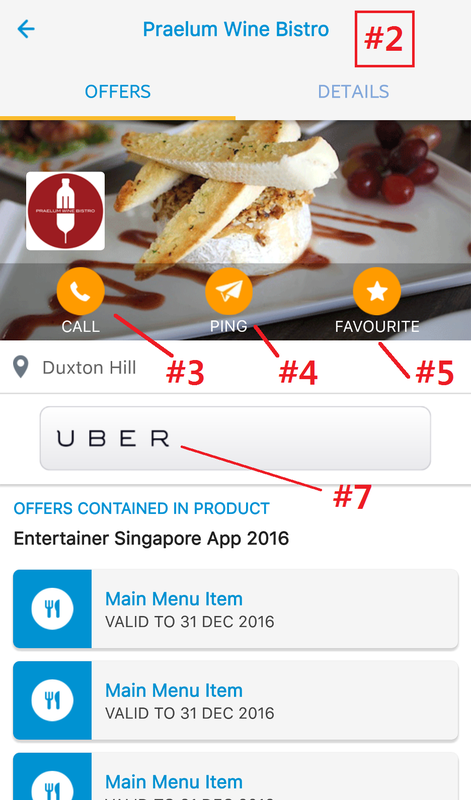 These 3 restaurants are merchants on the Entertainer Singapore 2016 app, and each offer three 1-for-1 main menu vouchers - this is seriously going to be so worth it! The Entertainer App interface is so sleek and cool now, with a really nice landing page! 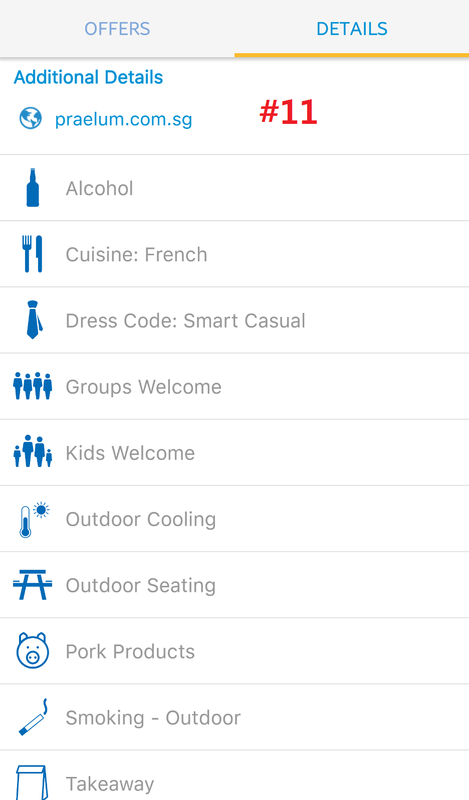 [#5] add the restaurant to your 'Favourite' list! 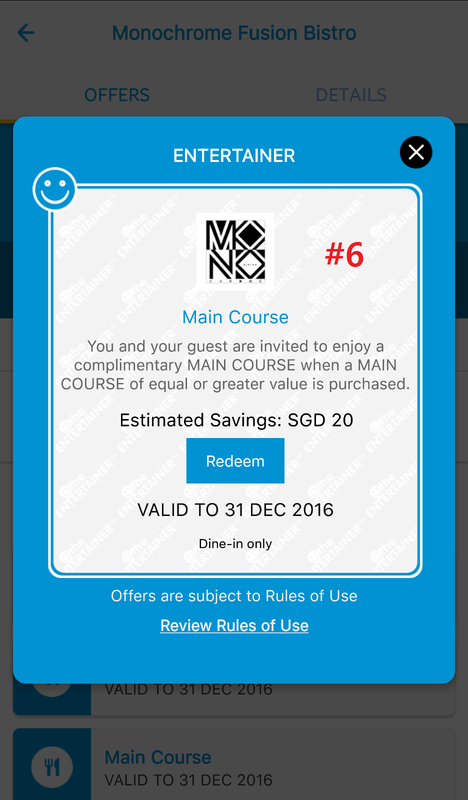 [#6] When you are already to use your e-voucher / coupon for the eatery, make sure you are there at the eatery of course! Show the restaurant your app, for them to validate the voucher for you. Of course, in my earlier posts about The Entertainer App, I have also mentioned the incorporation of Uber taxis [#7] in their app, so it is now easy for you to get a cab quickly after your meal! 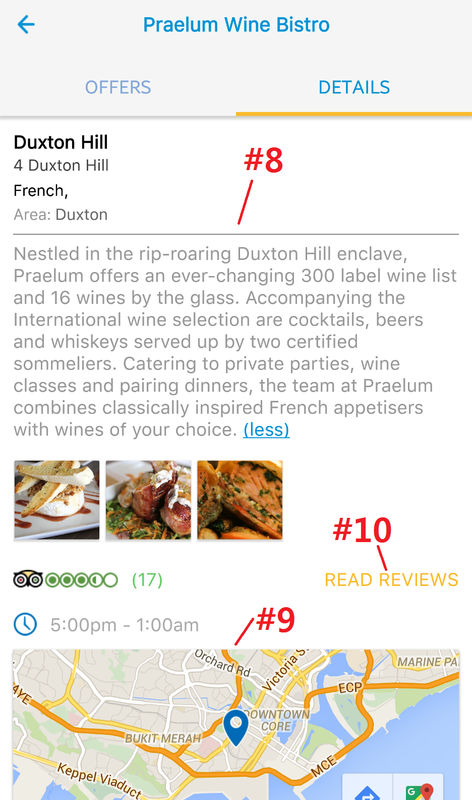 If you want to get more details of the eatery, simply switch the tab to 'Details' [#8] and read more about it, and even see the location map [#9]! If you're still considering to dine at the chosen eatery, you can also select read reviews (if available), and this button will directly lead you to agoda's reviews [#10]. Need even more specific information? Scroll down below the location map and you'll see most of the additional details [#11] you'll need. Any more specific information required (for what? ), you're gonna have to speak to the owner yourself, because this is as much info as you'll require. 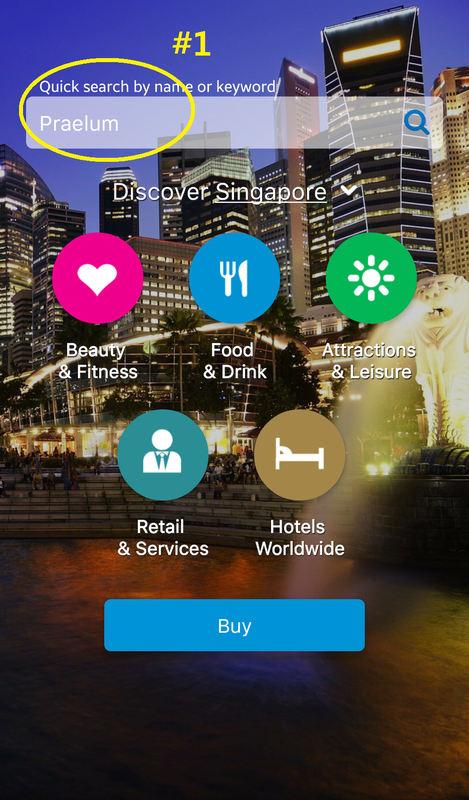 If you're not an Entertainer member now, you can now purchase it for SGD$85! In the long run, you'll definitely save MORE! For more information on the purchase, check them on their website here. This is post is published in collaboration with the Entertainer Singapore. Nan Hwa Fishboat 南華昌(亞秋)魚頭爐: 2nd branch revealed!